Remember that beautiful fabric a couple posts back with embroidery and sequins? I do love how this dress turned out. It's quite flattering for a 1920s dress! 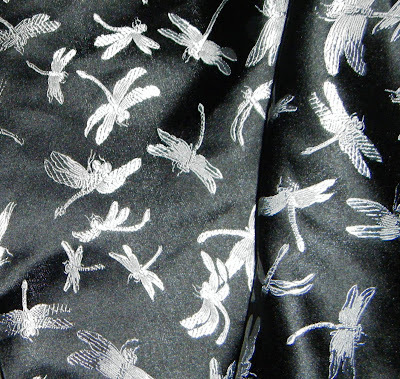 In other news I bought this dragonfly brocade for the train coat with the tassels and the funktastic collar. You know I love this fabric so much I just might throw on the tassels! Also, I haven't bought them yet but JoAnn's has this Vintage button series. I found some great 1920s ones that I'm gonna buy for the coat. Ooh how exciting! With this new fabric I have five dresses in the works! Yikes! I best get goin'! Now if only my shoes would get here!